Construction for Rayford Road Safety and Mobility Project began in April 2017 and is anticipated to be complete summer or fall of 2019. This project was funded in the Montgomery County 2015 Bond. Rayford Road closure between UPRR and Geneva set for weekend of March 22. Click here. 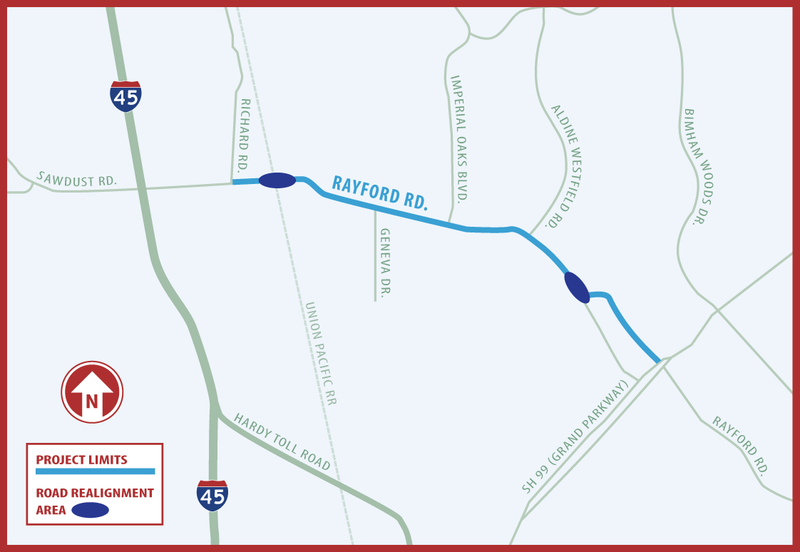 Rayford Road lane shift at Aldine Westfield starts today-Jan. 7. Click here. Update as of Wednesday-Oct. 24, 2018. Click here. Update as of Thursday-June 7, 2018. Click here. Local contractor Smith and Company was selected to complete the construction on Rayford Road in early 2017. The County and project team understand construction can be impactful but will do our best to keep you updated and reduce impacts. To maintain mobility during construction, the contractor will start by building the bridge and work on areas off the existing road first, to not impact current travel. Once work is needed on the existing roadway, 2 lanes of traffic will be open for most of the duration by removing the center-turn-lane. Construction is scheduled to begin in April 2017 through 2019. A more detailed timeline of the construction events will be shared soon so check back for updates. The County and project team understand that construction can be confusing and difficult to deal with if you don’t know what to expect. We want to share some things you should expect to deal with during the construction process. Noise: Construction uses heavy equipment and can be quite noisy. The loudest work will be scheduled for times that are least impactful. Dust: Construction work will kick up some dirt and dust. Drive easy knowing that we will minimize dirt and dust by using onsite sweepers and water trucks. Equipment: Heavy equipment is part of constructing anything. Expect to see heavy machinery in the right-of-way. Lane Closures/Delays: Lane shifts and closures are necessary to keep drivers and workers safe during construction. Plan your travel and expect some delays during construction. Vibration: Some construction activities, such as, drilling, concrete hammering, and excavating, can cause vibrations. These activities will be monitored and controlled to ensure vibrations are at a safe level. Utility Coordination and Relocation: Relocating utilities is necessary to expand the roadway. Expect to see crews other than the construction team working in the right-of-way. Access: During construction, some businesses may experience temporary access modifications. Working closely with property owners, residents, local business owners, and the community throughout construction is a priority for Montgomery County and Commissioner Noack. Both the County and contractor will work with the community to address concerns and identify opportunities to reduce disruptions during construction. Montgomery County developed a bond to address Rayford Road among other needed road projects. In November 2015, the Montgomery Bond was overwhelmingly passed with Rayford Road listed as the top project for Precinct 3. Commissioner James Noack recognizes the importance of addressing congestion and needed safety improvements and is moving forward with the Rayford Road Safety and Mobility Project as the first project from the bond to progress. May 2017 – Public Meeting – Coffee with the Project Team An informal gathering was held to share information on the background of the project, construction activities and traffic control. A public meeting was held to share project information with the public, including: history, design, schedules, and draft schematics. 98 people attended the meeting and were able to visit with the team and share their input on the project. During the design phase of the project, Montgomery County held an open house for property owners that would be impacted by right of way purchases. Attendees were able to visit with the team and learn more about the right of way purchasing process. Email Updates: If you are interested in receiving email updates on this project, please send an email to Rayford.Road@mctx.org with “Updates” in the subject line. Your contact information will not be shared and you may unsubscribe at any time. We are continually working to identify community members interested in this project. Please share this information with all those who may be interested!